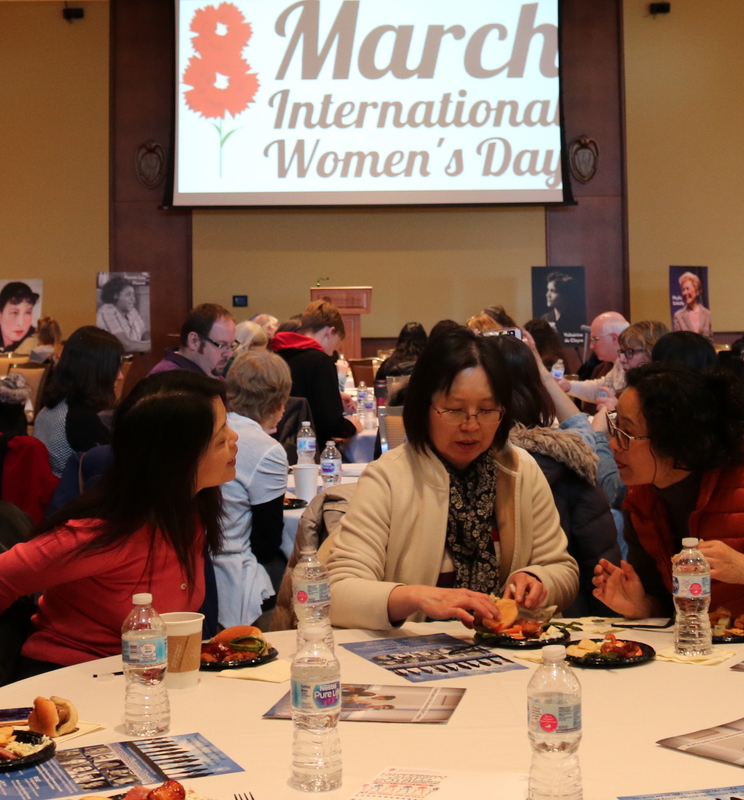 University Staff celebrated the efforts and accomplishments of women on International Women’s Day March 8 by taking a break, getting some food and having some conversation about how far women have come and how far they have yet to go. It was the first event by University Staff for the celebration, held in Varsity Hall at Union South and sponsored by the Office of the Secretary of the University Staff. 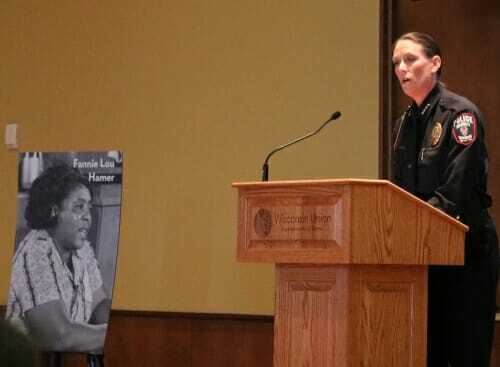 The keynote speaker was UW–Madison Police Chief Kristen Roman, who became chief in January 2017 after former Chief Sue Riseling’s retirement. Roman offered a little history about International Women’s Day. Its origins can be traced back to 1908 but it wasn’t officially recognized by the United Nations until 1975. She also shared a bit of her own history. Roman attended UW–Madison on a full athletic scholarship playing volleyball, an opportunity only made possible about a decade before she arrived on campus with the passage of Title IX. “Prior to Title IX, athletic scholarships for women were virtually nonexistent,” Roman said. Still, it was a challenging time, with Roman noticing that things weren’t exactly even between the male and female athletes in the mid-1980s. Even so, she’s thankful. She took a minute to thank some of those women. The one who taught her how not to “take guff.” The one who showed the benefits of diplomacy and patience. And the one who emphasized the persuasive power of humor, something that came in handy when she recently attended a seminar for new police chiefs and sheriffs from across the state. “I couldn’t resist tweeting out that one of the silver linings was there was no line for the women’s bathroom,” Roman said to laughter. Still, Roman acknowledged the disparities in the workforce, particularly in law enforcement. In Wisconsin, women comprise just 18 percent of the state’s police officers. Roman, like Chief Riseling before her, is the only female police chief in Dane County and one of only a handful in the state. On the bright side, Roman said, both the Madison Police Department and UWPD lead the country in the percentage of female officers, with both hovering at around 30 percent. UWPD slightly edges out MPD when it comes to the percentage of women in promoted ranks. “But the reality is that we need more women in this profession and even more so in our promoted ranks from detective to sergeant and all the way up to chief of police,” Roman said. And while people often associate bravery with law enforcement, Roman thinks of it in a much bigger way, especially when it comes to women — especially in light of this past year.